We spent a long day in the bus getting from Poland to Hungary. 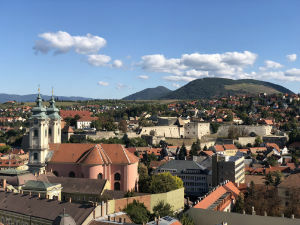 Our bus breakdown set us back a few hours so we didn’t reach Eger, Hungary until around 10pm so after grabbing a quick bite at a very nice restaurant which we were all too tired to really appreciate everyone headed to their rooms and crashed. We stayed the night at the Hotel Kodmon, a lovely hotel outside Eger. It was a really nice place, with beautiful grounds, a spa and very nice rooms with excellent wifi and another delicious breakfast. In the morning we got a ride into Eger and spent the morning exploring. They have a fine camera obscura at the Eger Lyceum that they demonstrate every hour, which was a treat and totally worth the ten-flight trek to see it. I’ve only read about them before – this was the first working one I’ve seen. We also went to see the Eger Basilica, the third largest in Hungary and another candle lighting opportunity for me. In the late morning we visited a local Montessori-like school and go to talk to some of the school kids and feel really inadequate about our lame language skills (the eight-graders are darned near fluent in English as they’ve been studying it since first grade). From there we headed off to a winery and had a fun tasting where we were serenaded by a violinist and got a tour of the caves where they store the wine. After leaving the winery it was back to the bus for a short 2 ½ hour drive to Budapest. We stayed at the Starlight Suiten Hotel that was centrally located right behind the Four Seasons Hotel. It was a nice place with lovely updated rooms (minor gripe: while the rooms appeared to have air conditioning – there were control units in all rooms – none of the units actually worked, but the windows opened so you could get fresh air until the outside noise became too much). My only real gripe with the place was the wifi. I assume the problem was that the main router was on the ground floor and they had repeaters on all the floors (our room was on the fifth floor) but the result was the spottiest connection ever. The signal looked solid but it didn’t last for more than 5 minutes until it cycled and dumped us off. This made sending email or editing files a real trick. And unfortunately this was one of our longer stays (3 nights). The lobby was the only part of the hotel with a reliable connection. Ah well, the perils of working from the road. Budapest is a BIG city with wide boulevards, much hustle and bustle, terrible and wonderful reminders of its rich history and the beautiful blue Danube running through it, separating the Buda side from the Pest side. We toured Buda one day and Pest the next – Buda is the older side, with the castle on a hill overlooking it all. Pest has most of the government buildings. Hungary’s history is one of invasion and occupation from ancient times to the present and the influences of all the various occupiers are evident everywhere. We visited St. Stephen’s Basilica which is Catholic but with Turkish influences in the design. There’s the House of Terror and the Hospital in the Rock which are reminders of the Nazi occupation and the years of Communist rule (not happy reminders). But there are also the charming sidewalk cafes, the thermal baths (we went to the Szechenyi Thermal Baths where Chuck and I both had maybe the best 30-minute massages ever and enjoyed a wet sauna, dry sauna and several indoor and outdoor thermal baths that made Glenwood Springs, CO look kind of pedestrian). The food is amazing! If you have a sweet tooth you could go crazy in Budapest eating cake and strudel. The ghoulash is yummy and paprika is the national spice and I have a whole new respect for it in all its sweet or spicy formulations. We visited the Great Market Hall which is a farmer’s market on steroids where locals and tourist go to buy fresh fruits, vegetables, spices, handicrafts (beautiful lace) and, of course, souvenirs. Budapest is home to largest synagogue in Europe and second largest in the world. 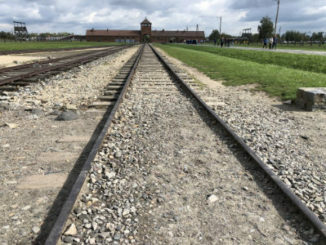 In the courtyard is the Raoul Wallenberg Holocaust Memorial Park that honors the more than 400,00 Hungarian Jews murdered in WWII and pays tribute to the helpers, like Raoul Wallenberg, who risked their lives to help. 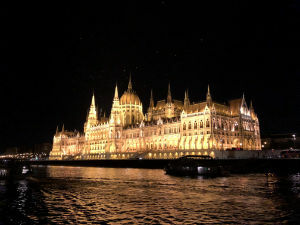 One evening we took a cruise on the Danube and got to see Budapest at night and I have to say it could (almost) give Paris a run for its money as a city of lights. We saw lots of the river cruise ships (barges?) and they are HUGE. I do think that might be a fun way to travel – but given their sheer size (length) they must be somewhat limited in the places they can go. 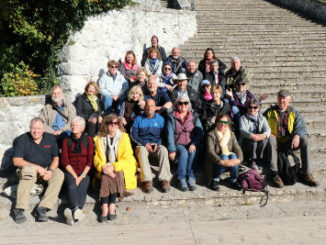 One of the things about tours like this is you get to talk to your fellow travelers and learn about all the places they’ve been and how they got there and we’ve gained some interesting ideas about where and how to go in the world (it’s a well traveled bunch) – and how much more of it there is to see! In three days we barely scratched the surface. 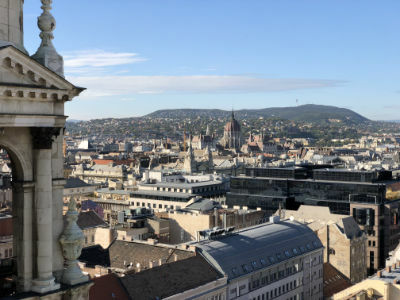 As we left, our guide Eszter called Budapest lasagna (because of its many layers) and that seemed quite accurate (and not just about Budapest, ALL of Central Europe!). Hearing a bit about Hungarian politics I realized that the problems we are wrestling with in America now are global problems (populist, anti-immigration movements, xenophobia) and the solutions need to be global ones – we are all truly in this together.